Welcome to The Mountain Pod! Our Mission at The Pod is to help you increase strength, stability and mobility, while finding ease, recovery and calm. The Pod offers Massage Therapy, various Yoga Classes and Athletic Therapy treatments to help you manage and alleviate pain so you can enjoy a healthy, spirited life. All Massage Therapists at The Pod are registered and have graduated from programs with at least 2200 hours of training. Therapists are members of the NHPC and are highly experienced in Deep Tissue, Sports, Pregnancy and Relaxation Massage. Massage Therapy can play a key role in restoring health, function, and performance. Our dedicated Therapists will work with you and any other health-care providers to help relieve your painful symptoms and bring well-being back into your life. Whether you are an athlete, new mom, desk jockey, or a retiree, you will be pampered and well taken care of by the experienced and knowledgeable Therapists at The Pod. We offer daytime, evening and weekend appointments. Receipts are issued, via email, after your service if you require reimbursement from an insurance company. Please visit the Online Booking page for further details and to book your appointment. Yoga Teachers at The Pod are certified and registered members of the Yoga Alliance, and are recognized as senior yoga teachers in Canada. We invite you to experience our dynamic, unique teaching styles that focus on strength, stability, mobility, and stillness. Our enthusiastic teachers use humor and compassion to encourage you to explore yoga in a way that honors your body, and helps you to understand its function (or dysfunction), as well as your particular movement patterns. Classes at our studio are small and intimate, and we excel at providing individual corrections and modifications as needed. 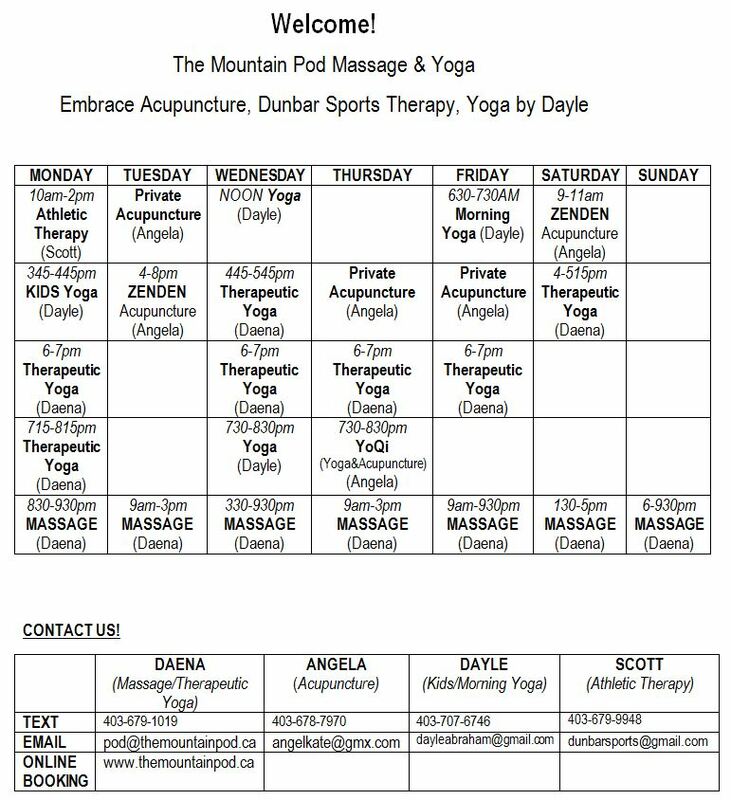 The Pod welcomes beginners, persons with injuries and/or chronic pain, experienced yogis, “Ageless” men and women (ie, those over 50), pregnant ladies, and athletes of all levels. Our diverse classes and teachers will help you achieve better function and better health. Private sessions are available for Individuals and Groups. 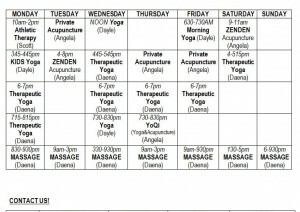 Check out our Schedule, Class Descriptions and Prices on the Yoga Page. Contact us today to join a class! Everyone and everything around us is our teacher. Copyright © 2015 The Mountain Pod.